I am pretty much done with my Christmas baking. Of all the cookies I've baked over the years this cookies by far is my favorite. 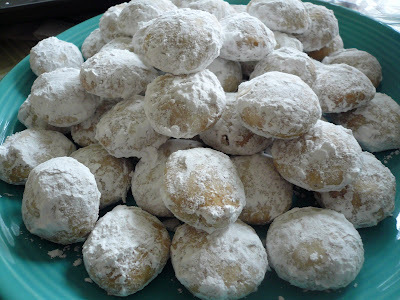 They are called Russian Tea Cakes/cookies or also known as Mexican Wedding Cakes. I am not sure why they call it cakes when it is a cookie. It can make from toasted nuts like hazelnuts, walnuts, almond, macadamia nuts, etc. The dough is fairly un-sweet, make into small balls and then rolled it in powdered sugar. They just melt in your mouth and you can't stop by just eating one. 1) Beat butter and sugar in a large bowl until light and creamy. Stir in vanilla. 2) Add in toasted nuts and flour until well combined. 3) Roll dough into a small balls and arrange the cookies into a baking tray about 1/2" apart. 4) Bake cookies in a pre-heated 325 F until golden brown on the bottom and just lightly brown on top. It might take about 20 min (depend on your oven). 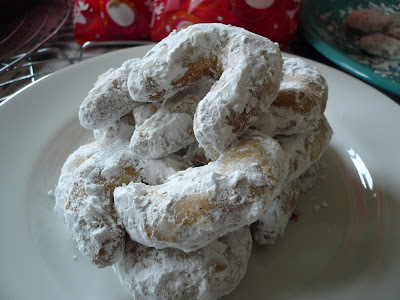 5) Cool cookies completely and then roll it in powdered sugar. Note : If the dough is too soft, chill it in the fridge for an hour before forming it into balls. You can form the cookies into crescent shape. Haa Gert, u dah buat ni..i've this recipe for quite sometimes..x sure sama x ngan ur recipe..since u cakap sedap..i think i should give it a try..looks nice! Wah, I'm getting ALL EXCITED!!! YAHOOO!!!! I just made a similar cookie to this. It uses only Pecan and it uses colored sparkles along with powdered sugar. Found it on Better Home and Garden site and its called Frosty Snowballs. can tell you that this cookies of yours are gorgeous, something a must have in your christmas list! I just look back all the old post of your ,cos I miss out a lot since I'm away to london for my sis wedding , I find your mai la kuit mmmmmm I wanted to bake this long time but not so sure about the Ingredients so it put me off now you are sharing it you make my day I love this . will try to bake it . JOAT, I think basically is the same cookies except different nuts and coating. BBO, are you selling any of your cookies? Gert,yesterday I just made a similar like your...mine called choc almond snowball..thinking of sending that to you but you make liao..going to bake some tonite,then I'm done too!! Beachlover, you don't have to bake other kind of cookies. Just send me some of the one you made and I am so looking forward to it. why? you want to buy? lol! kekekekke! we do make cookies, when we started, we were selling cookies then follow with cakes! BBO, if I am in KL I will definately buy some cookies from you especially the Macaroons.